Granted, you might think that your legs are already strong enough from running alone, so you might wonder why you should bother to strengthen them even more? Little do you know that doing so can not only improve your running performance, but also it gives that nice, toned look to your entire body. True, running alone can help build muscle, but at the same time it does not work out all of the leg muscles that strength training and other activities can help you achieve. That said, in this article we will tell you how to strengthen legs for running by offering you a “how-to” guide to get yourself started. Soon enough, you will be flaunting those fabulous legs for the next big run. Even though you will not be necessarily running for your leg-strengthening workouts, wearing running shoes offers good protection and support when performing them all the same. Wearing a pair that fits your feet, as well as support your arches, is the way to go. Our article on finding good running shoes is a great way to get started. Perhaps you might be wondering just why you need a chair for leg strengthening? To do lunges, of course! As well as any other exercises that test not only your muscles, but also your balance. Whether it is a simple dining seat or your office throne, any type of chair will do for this workout. It is an obvious that having weights will be very helpful for strengthening your legs, and so it comes as no surprise that items such as leg presses, hip adductors and abductors, even bench presses, will come in handy for all sort of leg workouts. You can bet that you will feel the burn once all of it is over! This also refers to stair edges, or any other edge that you can dangle half of your feet off of. 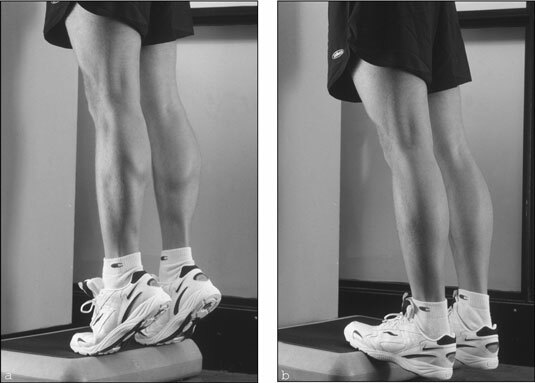 In essence, this helps work out your calf muscles, as means of strengthening them to add more power when it comes to pushing off better over long and/or intense runs. For workouts that do not require weights or chairs, yoga mats are good for supporting your body for those specific exercises, whether leg raises or curl ups for your hamstrings. Plus, it is a good to have for stretching out your legs at the end of it all, so that your muscles do not cramp up or feel sore the following day. Just like with the yoga mat, it is a good idea to have a foam roller to roll out your leg muscles after a long and intense strength-training workout. Again, it helps stretch out the muscles while also keeping them relaxed and supple to do other workouts in the future. When it comes to performing leg-strengthening exercises, there is not one way to go about it, but rather dozens of ways that you can do so. Here in this article, we highlight some individual workouts that you can do to target certain leg muscles in the body. Let’s get started! Targeting your glutes and quadriceps, this one is done with a chair to give you a breathless, intense workout you will be satisfied with in the end! With your back facing the chair, stand about 2 feet away from it. Bend your left leg down and have your foot touch the chair. Slowly, in a controlled manner, bend your right leg until it is at 90 degrees. Do about 20 reps before switching to the other leg. Overall, do about 2 to 3 reps.
As a runner, you tend to use your calf muscles a lot when exercising, so it helps to work out this specific area of the leg to make it more efficient for future runs. Such leg-strengthening exercises are not very difficult to perform, but they can surely create a good burn once you finish! Start by positioning your feet on the edge of a curb or a stair step, with the front of your feet firmly planted on the ground and your heels hanging over the edge. Keep your feet parallel with each other. Lower your heels slowly towards the ground before raising them high above and lowering them again. Repeat this in a smooth, controlled fashion, with about 20 reps and 2 to 3 sets in total. To challenge yourself a bit, also turn your toes inward as you do so, and outwards for even more of a burn all around your calves. After performing workouts which do not require any machinery, it is now time to bring out the weights for this sweat-inducing exercise. Having a spotter is highly-recommended for this activity to keep yourself safe. Place the barbell on your shoulders, with your hands firmly gripping both sides of the bar itself. Keep your feet at a wide-hip stance for support. Remove the barbell from its rack by stepping forward and slowly bend your knees while holding the barbell, keeping your quadriceps and glutes parallel to the floor. Return to standing position before lowering yourself again. Repeat with 2 to 3 sets at 5 to 10 reps each. Overall, running itself cannot target, let alone strengthen, all of the leg muscles in your body. That said, it is encouraged to supplement your runs with strength training, as means of fortifying those muscles for more efficient and powerful runs. So why not get started today? Feel free to comment, share and have a good workout!